Boost signal strength and data speeds on your cellular router / modem. Provides 5 to 8 dBi of gain on all 3G and 4G/LTE/xLTE/AWS frequency bands (698~960, 1710~2170, and 2500~2700 MHz) used by US, Canadian and Mexican cellular carriers such as Verizon Wireless, AT&T Wireless, T‑Mobile, Rogers, Bell Mobility, Telus, Telcel and most other cellular operators. 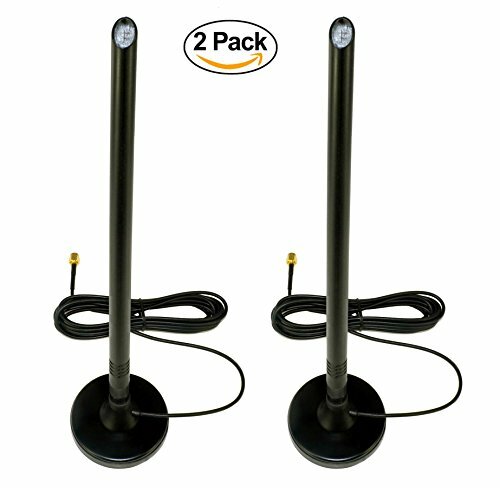 Includes the Proxicast 3G/4G high-gain 3G/4G omni-directional antenna, an extra large premium 3 inch magnetic antenna base, 79 in. (6.5 ft) of low-loss coax cable with an SMA male antenna connector. The detachable polycarbonate antenna swivels 90 degrees and rotates 360 degrees; the magnetic base and long coax cable allow optimal positioning for maximum signal reception. This antenna is a smart choice for applications where extra gain is required. • Overall Height: 13.25 in. • Diameter Base: 3 in. • Diameter Antenna: 0.5 in. Small hole in the plastic on the top of the antenna is by design and is not a defect. High gain antennas are appropriate when signal strength is below 60% (3 bars).